With elections around the corner, it’s a great time to ask: how do municipal politics affect us? 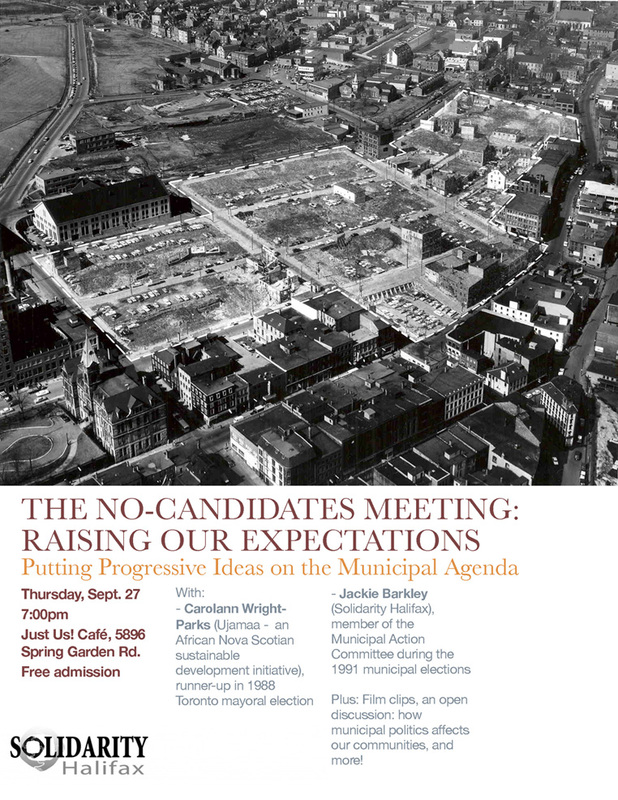 What more should we expect from our city?Come on out to have a discussion, learn about some history of progressive political organizing in Halifax, watch a film clip, and more!This event will be to talk about issues, not candidates. How do we organize ourselves to fight against regressive policies of austerity at the urban level? CAROLANN WRIGHT-PARKS finished second in Toronto’s mayoral race in 1988. She currently works with Ujamaa, a sustainable development initiative in the African Nova Scotian Community. JACKIE BARKLEY (Solidarity Halifax) was part of the Municipal Action Committee, a coalition of environmentalists, anti-poverty activists and members of the African Nova Scotian Community who developed a platform and candidate report card in the 1991 municipal elections in Halifax.